mill creek ridge is a truly singular, sometimes otherworldly cross section of shifting sightlines and undulating atmospheres. remote and rewarding, this sublime route climbs from the columbia river gorge deep into the rolling high country of Mount Hood's southeastern shoulder, through the haunting spires of the mosier/rowena burn before descending any number of configurations back into the gorge. accessible late spring through late fall, this is less a fixed route and more of an opportunity for modular exploration. The rolling high country above Mosier and The Dalles has intrigued us for some time now. Its deep valleys, stark looming mountainsides, intense seasonality and moody microclimates create a sense of impenetrable wildness. Spooky. Lush. Unforgiving. Revelatory. Eerie. And maybe just slightly haunted. 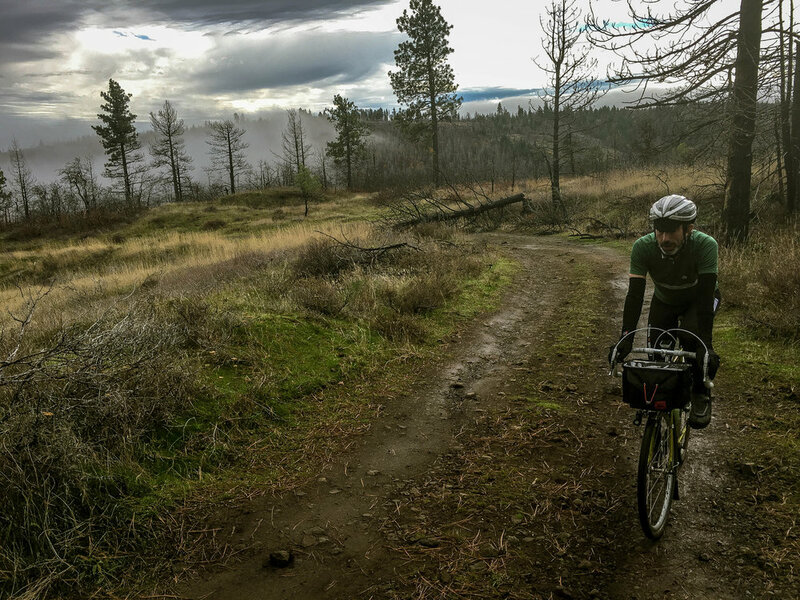 All of these descriptors set the backdrop for a difficult but rather rewarding set of route options involving Mill Creek, Mill Creek Ridge, Mill Creek Lookout, John's Mill, NF1711 and several other potential bits of gravel, singletrack and forest road. For clarity, we'll discuss the primary Mill Creek Ridge loop then note other configuration options in the section below. For our purposes let's assume we're starting in Mosier. It's a couple of clicks past Hood River but with none of the traffic, people or parking hassles. There is a mini mart, a place to use the restroom and sometimes a cafe, but mostly it's just a good headspace to start a ride. The vibe is quiet, mellow and generally a bit more blue-state Subaru and less red-state coal-roller, but then this is the jumping off point to rural Oregon so we're not making any promises. We begin by heading east along Historic Highway 30 toward Rowena Crest, a solid destination in its own right, but being somewhat jaded by the near-constant immersion in pristine Pacific Northwest scenery, we'll call it a nice fifteen mile warm up into the north end of The Dalles. You will want to find your way over to Mt. Hood Street which heads southwest becoming Mill Creek Road. This is where the fun starts. Mill Creek climbs gently for eight miles or so before the pavement ends ... 'and the West begins'. Each mile seems to intensify, becoming wilder as a stark rocky shelf begins to take shape high on the ridgeline to the left and dirt roads cut zig-zags into the exposed hillsides ahead at impossibly severe angles. Gradients steepen, contours double back on themselves as the evidence of civilization thins with each curve of the road. The elevation gain becomes visually apparent as the climb switches back into Buck Hollow, tracing the sinuous folds of the landscape upward. Our course takes a hard right at mile 32.5 onto Mill Creek Lookout Road, immediately kicking up into steeper, rockier, less traveled terrain. While the going gets slightly rougher, the country begins to open up into grassy rolling ridges with no shortage of face-melting sightlines to Mount Hood. 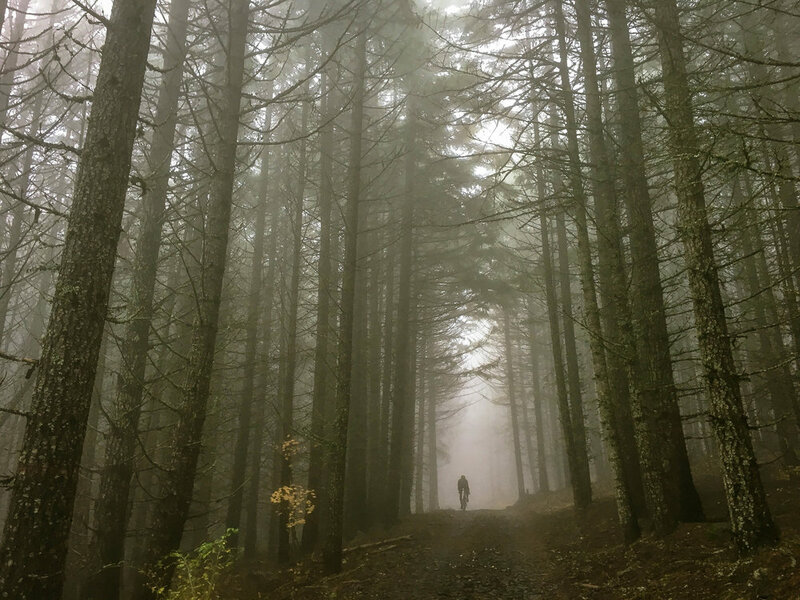 In the shoulder seasons, the conditions here can vary widely, from dense socked-in fog to rolling pockets of mist to wide open blue skies often within the span of a half mile. On clear days the views of the rolling hills, valleys, nooks, crannies, pocket canyons, ridgelines and burned out forests can be transcendent. At mile 34.6, a vague right hand spur leads to a vista point and the remains of the old Mill Creek Ridge fire lookout. Built in the 1930s it was removed in 1956. This location provides an incredible vantage point of Mount Hood and the surrounding valleys. If conditions allow. The descent from the old fire lookout skirts the edge of the Dalles watershed boundary magically rolling the gentle contours of the ridge before meeting Mill Creek Ridge Road at a four-way intersection. To the left, Mill Creek Ridge Road continues out of bounds into the protected Dalles Watershed area. Straight ahead is a newly graveled series of logging spurs which parallel the North Section Line Trail, a seldom used segment of singletrack which has fallen into disrepair and ultimately leads to NF17. 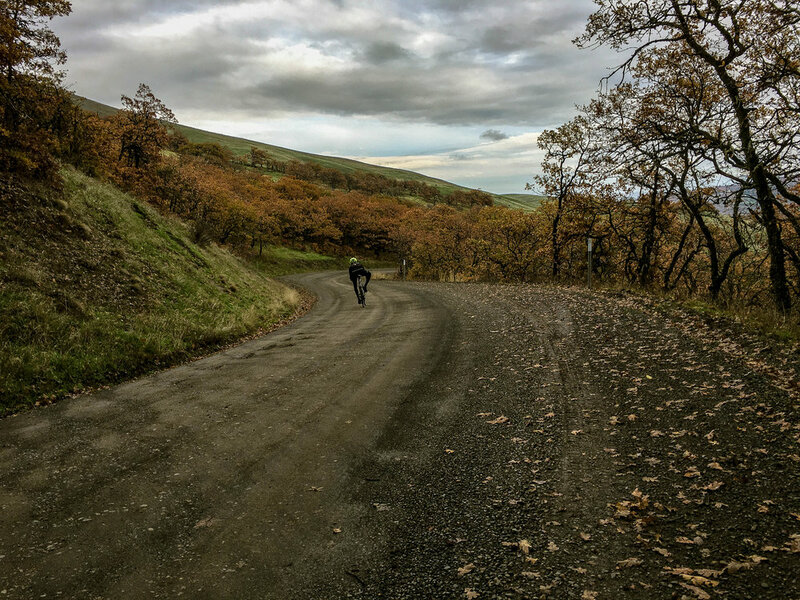 Our route takes us to the right onto Mill Creek Ridge Road which dips, weaves and climbs through the Mosier/Rowena burn connecting us with NF1711 and John's Mill Road. Affectionately dubbed the 'Pig-fucker' by Jbucky for its relentless gradients and rocky conditions, this bit has atmosphere for days as well as 18%+ in spots so pace yourselves. Milepoint 37.7 is a good opportunity for water filter refill as we cross the north fork of Mill Creek which runs year round. The next critical intersection w/ NF1711/John's Mil Road is juncture for one of the several modular back-half options of this route. A right turn onto John's Mill leads to Ketchum Road and the latter portions of both the Dirty Ketchum and Mosier Mayhem (short loop) routes and can be descended into either Mosier or The Dalles. Our journey takes us left into more chunky elevation. It's a punchy little kicker up to the green John's Mill gate and NF1711, which peaks out just shy of 4000 feet before finally rolling downward. While it's unlikely you'll see much active traffic, this bit of 1711 can be a bit muddy and potholed in the wet seasons. Mile 41.5 marks our second potential jump-off option. This left hand connector leads to NF17, Gibson Prairie Horse Camp, the '44 trails' and more specifically in our case the Surveyor's Ridge singletrack loop option (discussed below). Passing beneath the powerlines, 1711 becomes 1710, bear to the right at mile 44.7 and again at mile 46.4 onto upper Fir Mountain Road. While both 1710 and Fir Mountain Road can be continued to their respective conclusions into the Neal Creek and Pine Grove areas south of Hood River, we want to stick on Fir Mountain road only as far as mile 48.8 where it intersects Huskey Road. As Huskey Road pitches up for less than a mile, imagine the slow steady 'click click click' as a roller coaster ratchets up to release....at mile 49.5 Huskey immediately drops into a nine-mile thrill ride of perfectly maintained, low-traffic banked gravel perfection! Watch those corners! Hang a hard right onto Wilson Road at mile 54.3 and the curves sharpen and intensify, continuing to drop into Mosier via Mosier Creek Road, returning to pavement around mile 58. In the warmer seasons Mosier Falls swimming hole may be in order. It can be found off to the right hand side of 3rd Avenue just before coming into town. Poke around a bit and you'll find it. As mentioned above there are many different variations on this route generally using the same front end but breaking off into any number of different descent configurations. 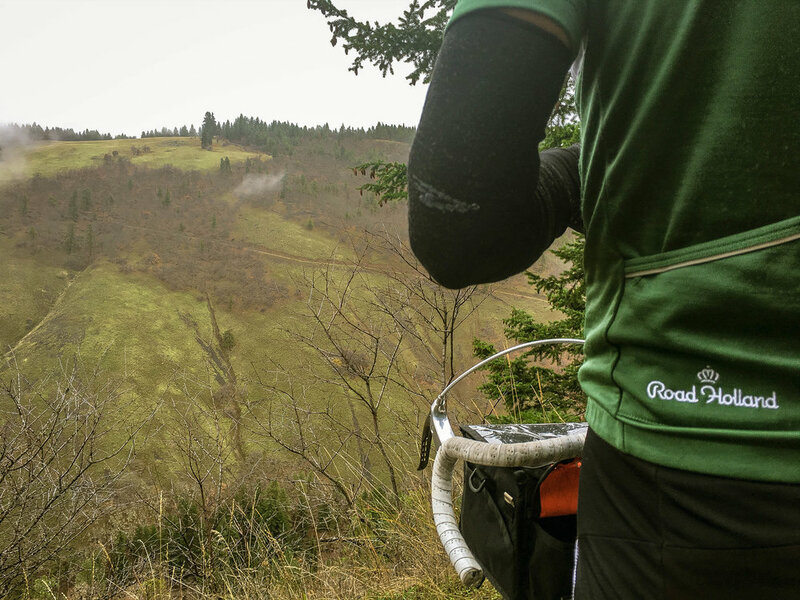 The Ketchum Road option combines the front end of Mill Creek Ridge w/ the back end of the Dirty Ketchum and Mosier Mayhem short loop routes. This version takes a hard right onto NF1711/John's Mill Road and descends back to Mosier via Ketchum, Vensel, Osborne Cutoff and Dry Creek Roads. 1711 between the gates has historically been a bit of a rough, chunky ride, but has packed down lately, rolling a bit smoother recently presumably due to logging activity. Friendly arrows may or may not point the way. TIRES: MINIMUM OF 33C. 40C+ RECOMMENDED. 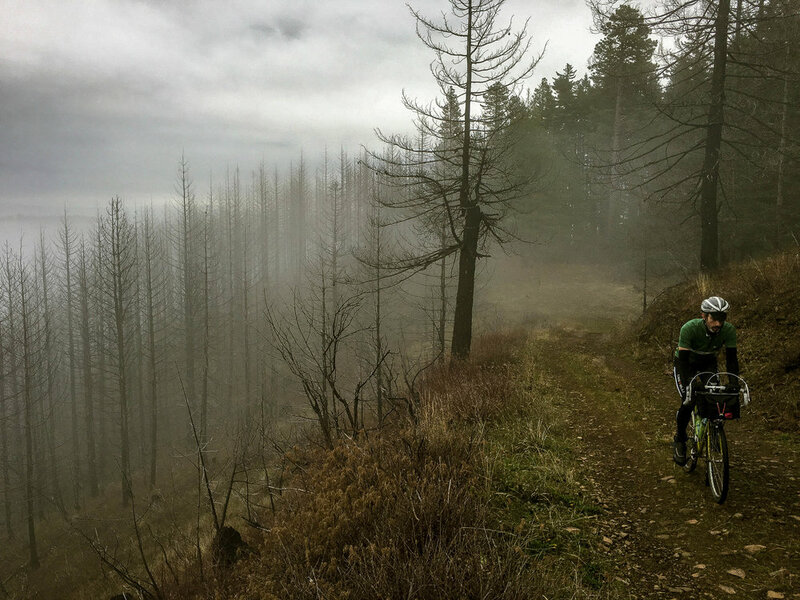 This variation adds in a healthy dose of singletrack, effectively throwing a mountain bike ride in the middle of a gravel route. In this configuration we connect to NF17 via the connector at mile 41.4, climbing just a bit past Gibson Prairie Horse Camp before jumping onto Surveyor's Ridge Trail for about 4 miles. If more singletrack is desired, of course it is always possible to continue up NF17 to connect w/ Surveyor's Ridge Trail at points further south. As routed here, Surveyor's Ridge is accessed via singletrack connector at mile 43.8. This segment of Surveyor's Ridge has some fairly rocky sections and is not recommended for standard CX bike setups. 40c+ is going to be the minimum as this is more the domain of monstercross/29+ or standard hardtail trail bikes. This version jumps back onto NF17, leapfrogging eastward to 1710 and Fir Mountain via logging spurs, reconnecting with the primary route to descend Huskey and Wilson Roads back into Mosier.